Nice overall job on the car. I'm doing something similar but not to the extent of yours. I did have a quick question though that I cant find any answer to on other forums; How to remove the speaker grills in the back? I cant tell if the entire grill should come out via clips or if the inner cloth covered portion should come out first. I've tried both, but the resistance is too much and I dont want to break them. How to remove the speaker grills in the back? I cant tell if the entire grill should come out via clips or if the inner cloth covered portion should come out first. I've tried both, but the resistance is too much and I dont want to break them. I didn't attempt to remove the grilles, I removed the entire panel. I'm not sure the grilles are supposed to come off. The panels are... not fun to get off since they are so enormous. 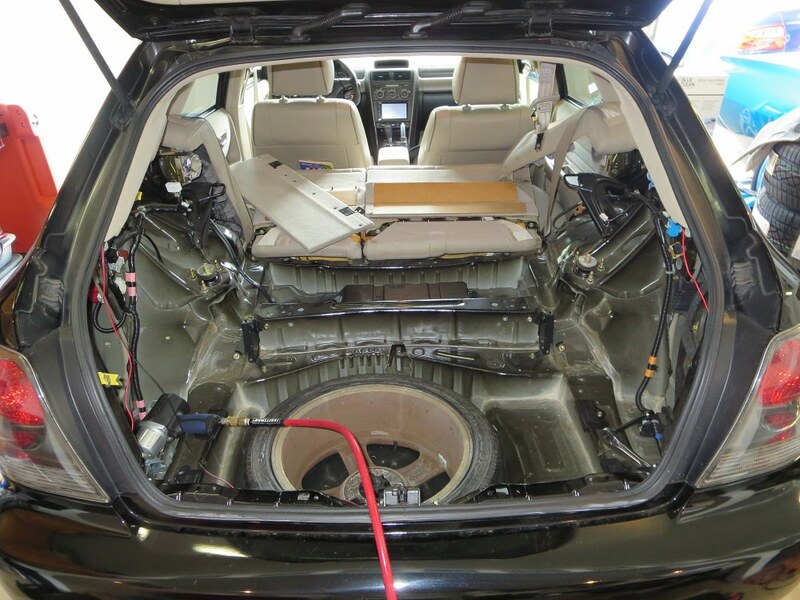 But, like everything else about the interior of these cars, you just need to remove some easily accessed screws and nuts and then start pulling. I've had it for a couple weeks because I was getting tired of hearing the brake grinding issue plus the stereo makes an intermittent high pitched, rev-based buzzing noise. I can make it stop, but it always comes back. I've had everything apart 10 times to try to fix it to no avail. So I replaced the front pads (with OEM) - the right outside pad was worn much worse than the others and it was uneven. I bought a new rubber boot thing for the lower caliper pins and silicone grease to make sure everything was working like it was supposed to. It kept grinding so I bought new OEM rotors. It was still grinding. So I took it to a shop and we messed with the pad hardware and it seemed to fix it. But, turning the wheel at certain angles causes it to STILL grind. So, I've come to grip with the fact it grinds. Maybe it needs a new knuckle, but I'm not ready to drop the money on that when, for the most part, it drives fine. I will continue to keep an eye on it. It is also wearing tires unevenly - badly. The inner shoulders of the front tires is worn flat while the outside tread looks new. I've had it aligned twice already, but I'll give it another shot. So I bought a new set of 4 Continentals and I'm dropping it off this morning to get them mounted, balanced, and an alignment. 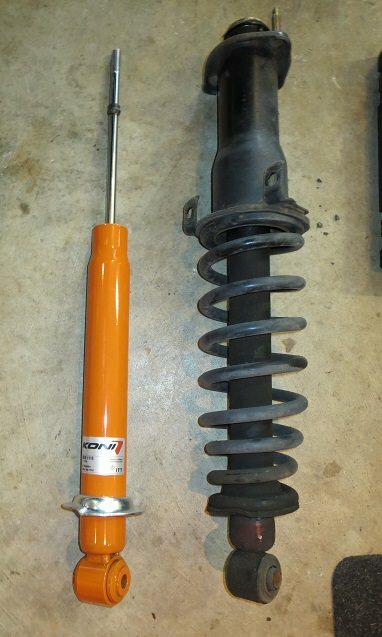 While I was at it I decided to finally replace the rear shocks. The right rear was blown when I got the car, it would knock every once in a while, but it drove fine so I left it. But I figure it's time and I didn't think it would take long. Wow, was I wrong. I started at around 3pm and finished after 10. I stopped for dinner, of course, but it took way longer than I thought it would. I got non-adjustable Konis. I've had good luck with Koni and the price was pretty close to the KYBs also available. The fronts are KYBs that came on it, but they are still good. Once they are worn out I'll replace them with matching Konis. My mom has been doing exactly what I got the car for - banging it around. Since it already had some dings and dents I figured she could knock it into things and get door dings and it'd be fine. 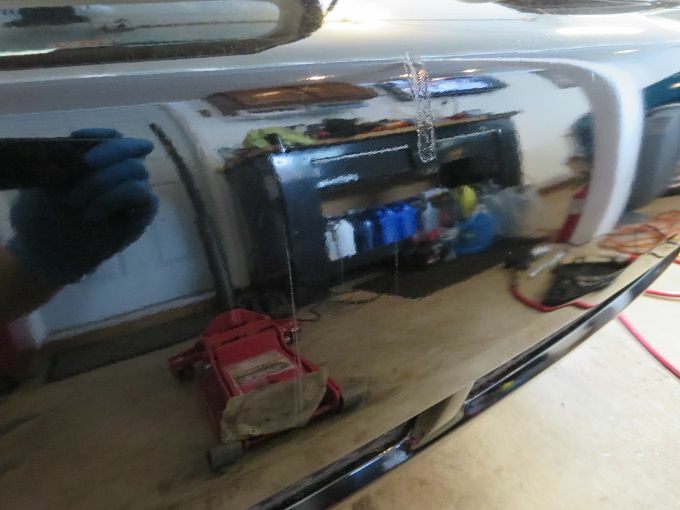 She's now closed her garage door on the beautifully repaired bumper twice. I've done the best I could touching it up and buffing it since. She's also closed her tennis ball stop system in the door twice, both times pulling a screw out of the ceiling of the garage and slamming it into the roof. There is one big dent from that and several large scratches. She drove it into a drainage ditch and got stuck while picking up my nephew from school. People had to lift the car out of the ditch for her. Otherwise it's been a great car. She claims to love it and balks at any suggestion to replace it. Though she's been driving my leased 2016 Buick Regal GS for a couple weeks, I'll see how keen she is to give that back now. Plus she saw an LC500 the other day and said she wants that as her next car. Hmmm, we'll see about that. The uneven wear on the front tires is most likely going to be bad bushings in the No. 2 control arms. If you do a search in the forum, it's pretty common especially on high mileage cars. I would get those replaced as soon as you can before your next alignment and new tires. You should also take the front calipers off and see if the lower caliper slider is seized, this will cause uneven brake pad wear. I had to take mine to Lexus and have them take out the bolt since it was way to hard to get out with my basic tool set. I said I was going to get another IS300, but this isn't at all what I thought I meant. The lease i was in was coming to the end and I started looking around at what was available. The current offer was too good to pass up so I took a 3 year lease on a nearly base model IS300 AWD. Recently my mom decided to back out of her garage before the door was fully opened. So now the hatch has some deep scratches. Fortunately she didn't break the window. I'm sure that wouldn't be easy to find. Also, since my last update someone in a lawn service truck with trailer tore the front bumper off in a parking lot and didn't stick around to talk about it. It actually turned out to be somewhat of a blessing. Now it has a new OEM front bumper with no paint issues, and the aftermarket driver's fender was replaced with OEM. I found *another* set of clear lens replacement fog lights. Everything is back together and looks better than before it was hit. I drove it a few weeks ago and noticed you had to hold the wheel so it pointed to about 11:00 in order to go straight. Otherwise it broke hard to the right. I took it to get aligned and I was told I needed to get adjustable rear lower control arms because the mounting bracket was so far out of spec. I am guessing as a result of the previous accident that was never documented - or repaired very professionally apparently. I took it for a second opinion and decided to go with their idea of shifting the subframe over slightly and making it up on the other side which still had some adjustment left. While they were at it, I had them pop in the FR-S differential so now it has limited slip. All in all, not a cheap last couple weeks. And I still can't solve the stereo alternator whine. It's up to 87k miles and still in great overall shape. My mom loves it and wouldn't let me get her something else. So that's why there are 2 IS300s in my life now.